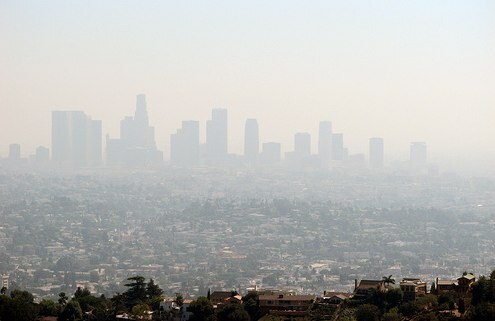 Los Angeles smog. Photo by Infinite Wilderness. The Air Resources Board today approved California’s plan to reduce the state’s greenhouse gas emissions to 1990 levels by 2020. An important component of the plan is a cap-and-trade program covering 85 percent of the state’s emissions. This program will be developed in conjunction with the Western Climate Initiative, comprised of seven states and four Canadian provinces that have committed to cap their emissions and create a regional carbon market. Additional key recommendations of the plan include strategies to enhance and expand proven cost-saving energy efficiency programs; implementation of California’s clean cars standards; increases in the amount of clean and renewable energy used to power the state; and, implementation of a low-carbon fuel standard that will make the fuels used in the state cleaner. Click here to see the full staff presentation made to the Board yesterday morning. Click here to read the entire “scoping plan,” which was developed through a series of workshops since November 2007 and finally approved yesterday. Today, California is expected to pass regulations for the state’s 1 million diesel vehicles, whose emissions have harmful effects on the environment and human health. The proposed regulation would require existing vehicles to be upgraded or replaced to comply with specified particulate matter and nitrous oxide emission standards. It would require exhaust retrofits in 2010 and 2011 and fleet modernization between 2012 and 2022, which could include things like new exhaust filters and engines. Click here to read documents from the full proposal. The cost of the control equipment is estimated at $5.5 billion. But consider the do-nothing option: 9,400 deaths from soot and smog over the next decade and health care costs estimated at $48 billion. Part of today’s proceedings stem from reactions to studies that concluded diesel emissions are deadly. Trucking company workers who have been regularly exposed to diesel exhaust from vehicles on highways, city streets and loading docks have a higher risk of lung cancer than other workers, according to a new national study. The study, based on 31,135 worker records, found that drivers who do short-haul pickups and deliveries, including loading and unloading containers at ports and working at freight-delivery companies, had the highest rate of deaths and disease.